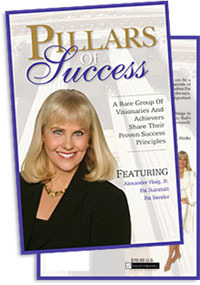 Share Their Proven Success Principles! ...It's no secret that success is something everyone wants. The process can be a mystery and Pillars Of Success is a book all about revealing success secrets of several of the most powerful people in business today. Contributing author Pat Bender has an Awareness Is Power® process. "The more aware you are, the more aware you'll become, she says. You will learn what Pat says are three important things leaders and successful people have in common. 1) Leave no stone unturned. 2) When your customer says 'No' - that's when the selling begins. 3) Always have a reason to come back. ...You'll find out if former US Secretary Of state Gen. Alexander M Haig Jr thinks people are born hard wired to be good leaders, or if it can be a learned skill. ...Whether you are seeking success in business, relationships, or in an academic environment, Pillars Of Success will give you some excellent advice on how to attain your goals. Success is at your fingertips, just waiting for you to learn how to achieve it - and Pillars Of Success can help you! "In the end, the only people who fail are those who do not try. Taking Pat's Awareness Is Power® course has given me the courage to go forward." ...Bruce H Williams, VP, Integrated Technology Services, Federal Sector, IBM Corporation. "As the coach of a Super Bowl winning team, I guarantee that the powerful strategies in this book will advance your abilities to your personal Super Bowl of success. Pat Bender and the Awareness Is Power® process will immediately become an essential component of your business and your life." ...Brian Billick, Super Bowl winning Coach, Baltimore Ravens.